Team Coco has successfully run an excellent production of ConanCon for the 4th year. With the cast of Breaking Bad, Predator, Glass and Aquaman headlining their shows, it was sure to be an entertaining evening for everyone who attended. It’s not just the celebrity guests that draw fans to the tapings– closing the night out with a Conan Funko Pop is the cherry on top to one of the best off-sites during San Diego Comic Con. Conan is one of the most entertaining hosts to come down to San Diego and moderate a panel of some of the most highly anticipated upcoming movies and TV shows. It isn’t all clips and generic questions about filming; fans can enjoy in-depth interviews that open up the story and life on set between the actors and crew. I was able to attend a taping where the cast of Predator attended. While it’s a large cast to have, Conan had the perfect questions for each actor and actress to open up and have their personality shine through. 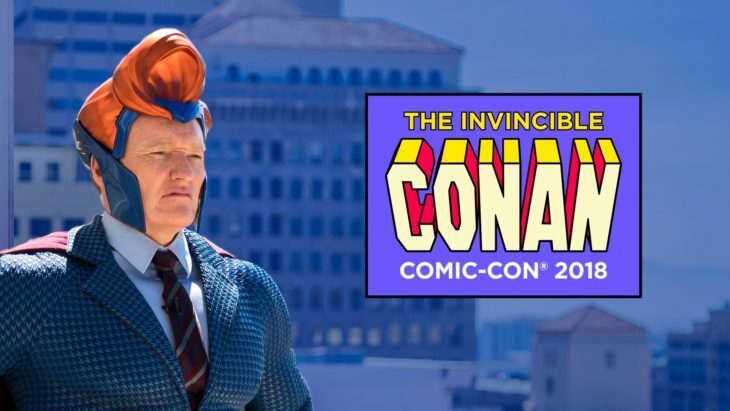 Coupled with a great interview segment, Conan also had a number of comedy skits reflecting life at San Diego Comic Con. One of my favorites was a Norman Reedus cameo where he picked up his E-Scooter on stage. Being in San Diego a few days, you notice the rideshare scooters on nearly every street. It’s a joke someone outside of the convention bubble may not get, just like the blinky-blinks of the Hall-H line. Appropriately, the pop given away that night was a Predator Conan. The night before it was a Poe Dameron Conan, and the next nights following had an Ant-Man Conan and Hellboy Conan. In addition to the tapings at the Spreckels theater, Team Coco also hosted Team Coco house: a nightly show held closer to the convention center that hosted stand-up comedians, writers, podcasts and even a Final Space table read. I appreciate the work that Team Coco puts forth in fitting in with the San Diego Comic-Con crowd. It’s a staple I look forward to, and I cannot wait to see how they evolve in the years to come.